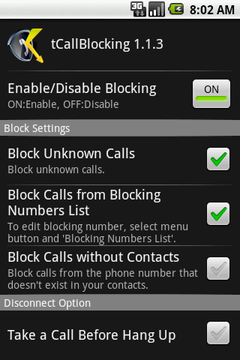 "tCallBlocking" is an application hangs up calls from unknown, blocking target number and etc. automatically. 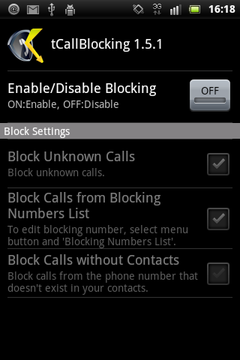 Using "tCallBlocking", unknown calls can be hung up automatically. Recommend for people don't want to be disturbed from no need calls. 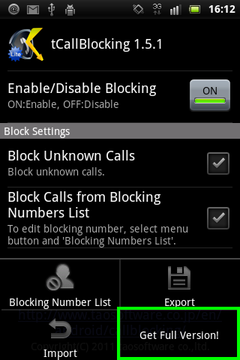 Blocked calls appear on a call log. Support for Android OS 4.0 (Galaxy Nexus). How to upgrade tCallBroking Lite to Full version. 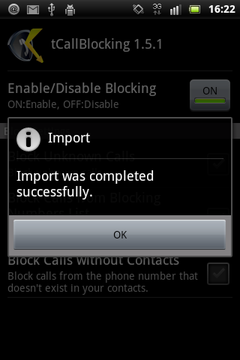 Start a tCallBlocking, the below screen appears. To check the "Enable/Disable Blocking" box, tCallBlocking is enabled. If tCallBlocking is disabled, clear the checkbox. 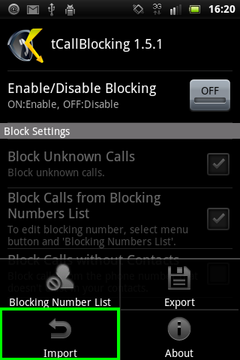 To check the checkbox, blocking unknown calls is enabled. 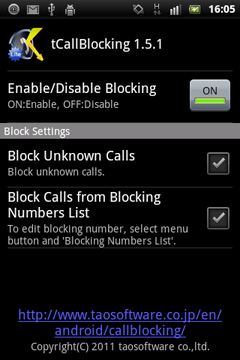 To check the checkbox, blocking calls from registered phone number is enabled. To edit blocking number, select "menu" -> "Blocking Numbers List". 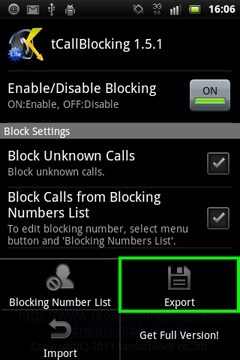 To check the checkbox, blocking calls from phone number that doesn&apos;t exist in your contacts is enabled. 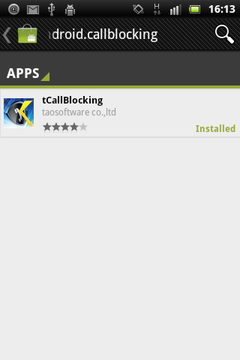 To check the checkbox, tCallBlocking takes a target call before hang up. It's same to press answer button and press end call button. The option may avoid forwarding or sending to voice mail, but it results in cost in some countries and carriers because of answering a call before end call. Please be careful it! When the OS version of you device 2.3 and later, This check box will not appear. This function does not work well because API security was changed by Google. To select "menu" and "Export", settings and blocking number is exported to SD card. Use import, settings restore from SD card. To select "menu" and "Import", settings and blocking number is imported from SD card. 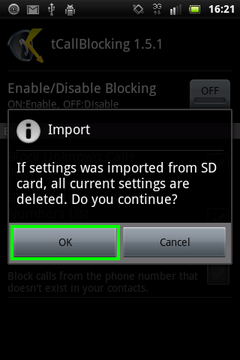 Be careful deleting all current settings and blocking number, if you use import from SD card. To show "Blocking Numbers List", select "menu" and "Blocking Numbers List". Blocking number target information is displayed. To add a blocking phone number, press a "menu" and "Add". 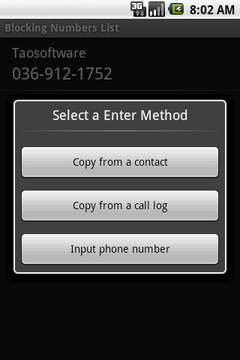 Select "Copy from a contact", "Copy from a call log" or "Direct Input". If "Copy from a contact" is selected, a contacts list is displayed. If "Copy from a call log" is selected, a call log list is displayed. Choose a target phone number. Enter name and blocking phone number. Full version supports for using *(wildcard character) in blocking phone number. For example "800*" blocks 800-xxxxxxxxx. If "Copy from a contact" or "Copy from a call log" is selected, name and phone number is already filled by the selected item. Confirm the entry and click the "OK" button. When edit target phone information, select an item from list and change the entry. When delete a target phone information, touch and hold a delete item. Select "Delete" and press "OK" button on the delete confirming dialog. When delete all phone information, "menu" and "All Clear". 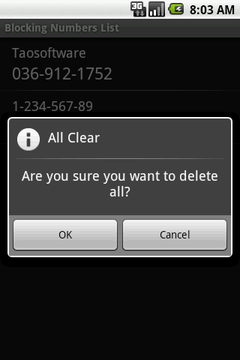 Press "OK" button on the all clear confirming dialog. Download from Android Market "Apps" -> Lifestyle"
To upgrade tCallBlocking Lite to Full version, you can import your settings of Lite version(ex. Call blocking list) to Full version. Launch tCallBlocking Lite, and confirm your current settings. This will help you to check whether the migration carried out well. To export your settings, your deveice must have writable SD card. After confirming your settings and SD card, Export your settings to SD card. Select "Export" from the menu. Confirming dialog will appear. Select "OK" button. 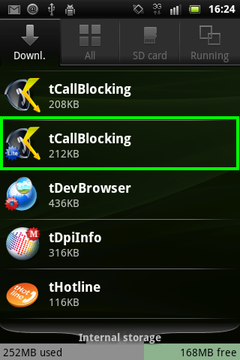 If you are using tCallBlocing Lite ver.1.5.1, you can download the Full version via application menu. If you are using tCallBlocking Lite ver.1.5.0 and eralier, please go to Android Market by yourself and download Full version. Launch Full version and import your settings. Select "Import" from the menu. Check whether the migration carried out well. After confirming your settings, uninstall tCallBlocking Lite. That is the end of migration. Support for import and export of settings. - Supports Samsung GALAXY Tab. - Crash bug on Android 1.5 is fixed. - Bug fix. 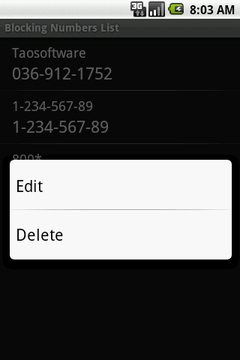 The contact list is improper when blocking phone number is copied from contact on Android 2.x. - The icon quality is improved for Android 1.5. 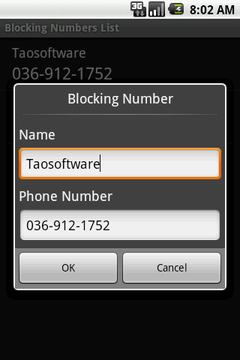 - Support for using *(wildcard character) in blocking phone number. - Add high and low resolution icon. 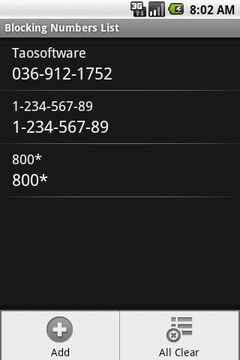 - Support for copy from call log when blocking number is registered. - Bug fix. Blocking phone number couldn&apos;t be include +. 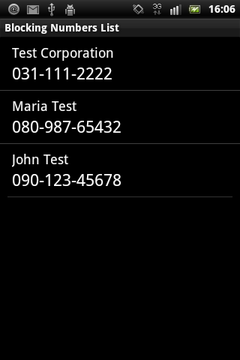 - Support for hanging up calls from registered phone number (Max 3 targets can be registered). We make a customized development of software for Android. Please feel free to contact us at any time.